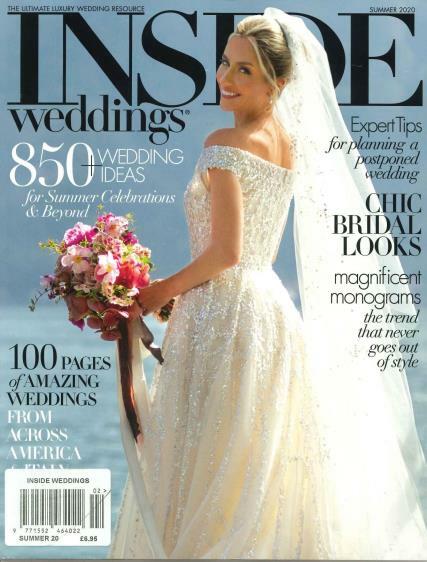 Inside Weddings Magazine is issued quarterly, direct from the United States and is the ultimate weddings magazine. Buy a single copy or subscription to Inside Weddings magazine. It is a necessity for any bride to be or wedding planner. It contains one of the largest, most exquisite wedding directories on the market, along with the latest wedding trends (including favours, flowers, colours, co-ordinates and most importantly - Gowns), features on current designers and advice on jewellery, venues, hairstyles, cakes and bridesmaids. The magazine also features ‘Inspirational Weddings’ from real couples who have recently tied the knot to offer ideas and support to engaged couples. Readers will find an events calendar, product information, stockists and vendors recommendations and a step by step guide to creating your perfect day. Whether your wedding is small and intimate or large and spectacular, Inside Weddings Magazine is what you need to help you get there.